So, I started on another pincushion. These are half inch hexagons, the smallest I've made so far and super fun to make and assemble. I also love being able to put such tiny scraps to good use and turn them into something awesome! I can't offer any solution to the tips being cut off. I've done a lot of that piecing but can't figure out why that would happen unless it has something to do with the small pieces. I've used much larger pieces. I'll have to do some thinking about it. Like the hexies for the next pincushion though. Bright and colorful. OK, just in case this helps... whenever I piece triangles I make sure that they are oversized so that there is a 1/4" overlap on each side. This creates an extra 1/4" margin so that you can sew your new edge without cutting off the tips. your pincushion is really nice. love the fabric choices. there should be a 1/4 in. extra for your seam. your ruler will help you see that. and the triangle pieces should look like flying geese where the seam goes exactly to the corner of unfinished edge. the 1/4 in. seam on the side and the bottom should keep the point intact. Keeping points on stars is one of the hardest thing to do in quilting, I think. One of challenges for this year (on the Mother List on my blog) is to make a flying geese quilt, partly because I want to try something with triangles. 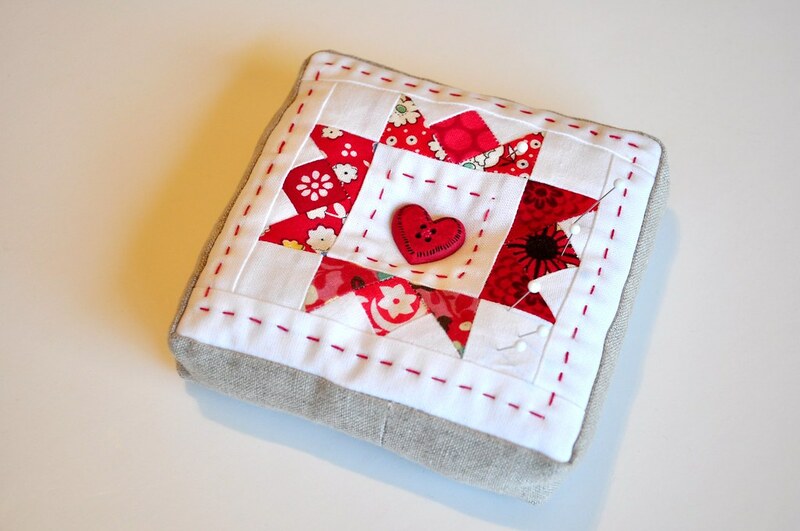 Maybe I'll attempt a little pincushion first! Stop with the cuteness! There is not enough time in my day to keep up with all the inspiration. 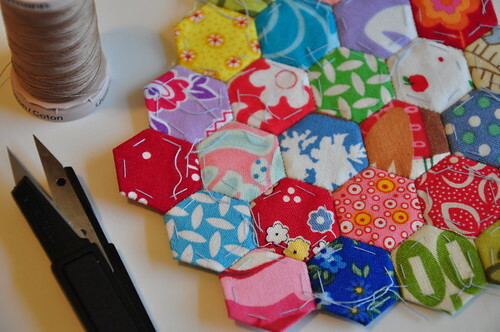 Can't wait to see your teeny hex completed..
As for the 1/2 inch hexies...love, love, love them! That is going to be one AWESOME pincushion! wow, look at those tiny little hexagons. those are going to be a cute pincushion.